An all-new Supercars drivers’ parade will mark the start of the 10th edition of the Watpac Townsville 400 next Thursday. A SuperCruise in classic cars will run along The Strand on Thursday evening, July 5, beginning at 5:15pm on the eve of the Reid Park event. It will be followed by an autograph session and live filming of Fox Sports’ Supercars Trackside. Townsville’s maiden driver parade through the city – from the Fryer Street roundabout to Strand Park –follows the annual transporter parade from midday on Wednesday July 4. 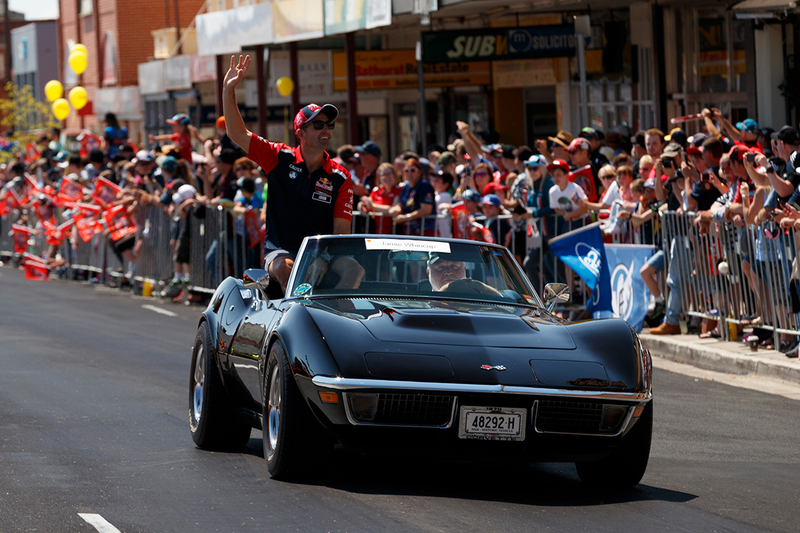 “It will be a huge afternoon at The Strand,” Watpac Townsville 400 Event Manager, Sam Pearce said, “starting with the street parade from Fryer Street to Strand Park followed by the drivers’ autograph session and the live production of Supercars Trackside at one of North Queensland’s most iconic locations. “It’s a free event for everyone and we’re anticipating a strong crowd, who will have the chance to meet their favourite drivers before a huge weekend on the track. The event has been organised by Townsville City Council in conjunction with Supercars. After the parade concludes at approximately 5:30pm, drivers will take part in a signing session from 5:45pm to 6:15pm in Strand Park. Jess Yates will also host Supercars Trackside with Mark Skaife and Russell Ingall from 5:30pm. The team will be joined by the top three in the championship – Scott McLaughlin, Shane van Gisbergen and David Reynolds – before a big weekend of racing. There will also be free entertainment, food vendors and photo opportunities with the drivers, with fireworks at 6:30pm to close the event. “It’s going to be an amazing sight watching some of the best drivers in the country being paraded down The Strand in some of the most iconic Aussie muscle cars ever built,” Deputy Mayor Cr Les Walker said. “The whole town is getting into the spirit for the race weekend and I’m sure there will be a huge crowd all along The Strand. Practice for the Watpac Townsville 400 starts on Friday July 6. Reid Park will also host two big nights of concerts during the weekend, under the Watpac SuperTop. The Hoodoo Gurus and Baby Animals on Friday night will be followed by performances by John Farnham and Daryl Braithwaite on the Saturday night.